You won’t be surprised to hear that my fellow scientists spend a lot of time in the field in the spring and summer (for species inventories, invasive species control, property monitoring, etc. ), but when the snow flies and temperatures drop below zero, they venture out much more rarely. So I was surprised to meet my colleague Valérie René, a biologist, on her way to the Montérégie on a chilly November morning. When I asked her what she was going to do outside in this weather, she said that she was going to install probes in a snake hibernaculum (underground refuge) so that their temperatures could be recorded. Novice that I am, she explained to me that the transformation of natural environments is having an impact on the needs of species — in this case, the gartersnake. 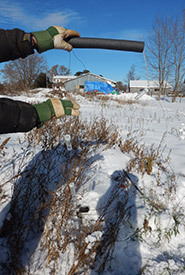 Having settled in agricultural land, gartersnakes need a helping hand to get through winter, and this is where Valérie comes in. In the vicinity of Saint-Georges-de-Clarenceville in Montérégie, the Nature Conservancy of Canada (NCC) is protecting an agricultural lot in collaboration with the Ministère des Forêts, de la Faune et des Parcs and several teams of professionals, to make it a site with high ecological value. A hibernaculum had previously been installed in the field. The two-metre deep hole was packed with stones and logs all the way to the surface and covered with earth, with just a small opening for the snakes to enter. It has to be deep enough so that the bottom of the hibernaculum does not freeze, even during the coldest part of the winter. In fact, to make sure of this, Valérie installed probes: one at the bottom of the hole, another in the middle and a third at the surface. Throughout the winter, temperature data gathered from the probes is recorded and then collected in the spring. This type of intervention is part of a wildlife management approach in an agricultural environment. This is the first time in Quebec that NCC has implemented such a system. 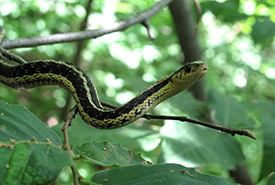 “Snakes are generally unloved, but gartersnakes do us a lot of good, especially by getting rid of certain pests, such as small rodents,” explains Valérie. That is why taking care of them is important for the good of the overall ecosystem in the area. 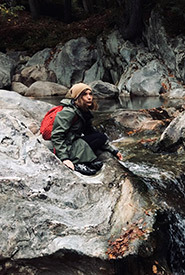 Julia Haurio has been the communications coordinator for NCC’s Quebec region since September 2018. Read more about Julia Haurio .